COMMENCEMENT CEREMONIES by Vocational High School, at which 39 graduates were awarded diplomas were conducted last night at Classical High School Auditorium. 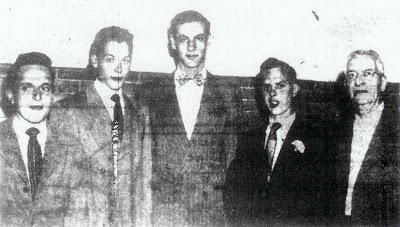 Class officers are left to right, Edward L. Viricel, president; Vincent E. LeBlanc, vice president; Richard A. Pote, secretary; Ralph W. Babb; principal. Vocational High School, Lynn's youngest secondary school, staged their second annual graduation exercises last night at which 39 students received their diplomas before a large throng of parents and friends. The ceremonies were staged at the Classical High School auditorium. Mayor Stuart A. Tarr presented diplomas to the graduates and the commencement address was delivered by Nelson F. Schlegel, supervisor of personnel, meter and instument divisions of West Lynn Works of the General Electric Company. The graduating class of 39 students was a decided decrease over a year ago when 70 seniors were awarded diplomas. Principal Ralph W. Babb opened the formal ceremonies with words of welcome after the seniors had marched into the auditorium and a flag salute was conducted by students. Four talks on technical subjects relating to the course of study at the school were given by honor students. John Reed spoke on "Relation of the general course in Vocational High School to Industry": Richard Simons talked on "The Cabinet Maker -- A Modern Alchemist": Warren Johnston on "The Machine Age" and William Amero on "Drafting." Also included on the commencement program was a selection of songs by a school ensemble, accompanied by Robert Shaw, a member of the junior class. Edward Viricel was leader of the opening flag salute, with Vincent LeBlanc, color bearer and Willard Currier and Robert Smith, color guards. A reading from the scriture was givin by Principal Babb. Those who took part in the singing ensemble were: William Amero, Anthony Civiello, John Curdo, Willard Currier, Leonard Kalapinski, Vincent LeBlanc, Leonard Lombardi, Thomas Moulton, John Nowakowski, Fred Paschukoff, Brace Pinney, Jr., Richard Pote and Kenneth Roy. Diplomas were awarded to the following graduates: Unit trade machine drafting course, William Frank Amero, John Anthony Curdo, Christos Leofilos, John Francis Nowakowski, and Kenneth M. Sabina. Unit trade machine shop course, Ronald John Adams, Anthony Canio Civiello, Willard Harley Currier, Everett J. Finley, Roland James Jenkins, Donald Ernest Johnson, Warren A. Johnson, Leonard T. Kalapinski, Vincent Lombardi, Chester Lewis McIntire Jr., Thomas Otto Moulton, Robert Orin Mudge, James Louis Newhall, John William Newhall, Fred Joseph Paschukoff, Brace Carlos Pinney Jr., Richard Alden Pote, Robert William Rowley, Kenneth Maynard Roy, Robert Joseph Seaberg, Robert James Smith, Edward Leo Viricel and Dana Richard Walfield. Unit trade cabinet making course, Robert Charles Britton, Roy Ellwood Curran, George William Peach, and Richard Alan Simons. General vocation course, Stewart Allan Bryer, Richard Joseph Buckley, John R. Marston, John Erving Reed, Henry William Reynolds, Jr., and Euggene Ricciardelli.